Before we get to Katie, it’s worth mentioning recent and current weather for Easter Sunday: the first convective day of 2016. 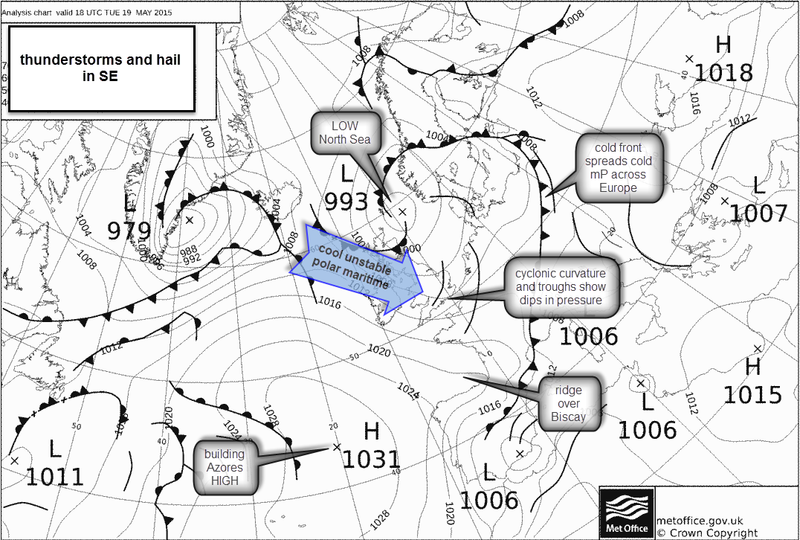 A cold pool of polar upper air followed the impressive cold front yesterday which developed a very long squall line. 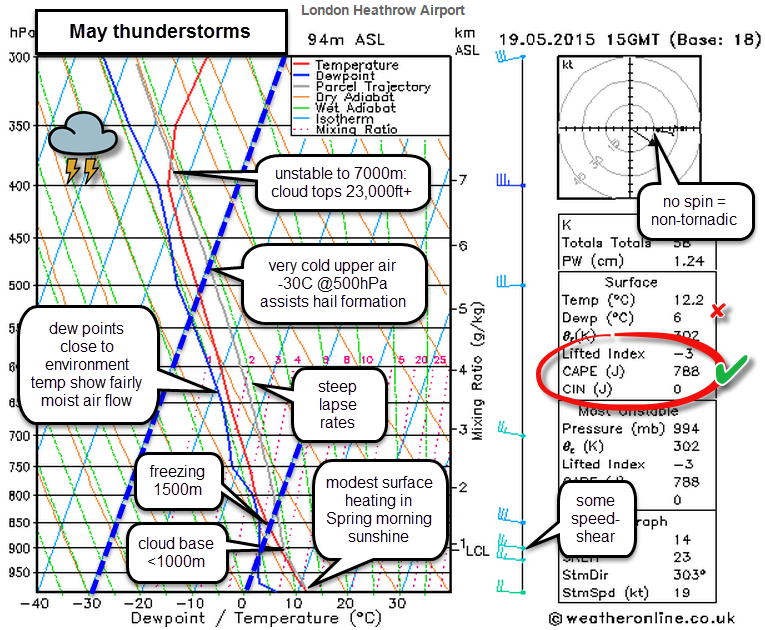 Thundery conditions followed the cold front in an unstable Polar airmass with notable CAPE (convective available energy) and negative 2 Lifted Index for the time of year – both indicators of potential thundery heavy shower activity. The limiting factor on multicell thunderstorms locally was lack of wind shear and an anticyclonic jetstream, both subduing anything truly impressive or sustained. 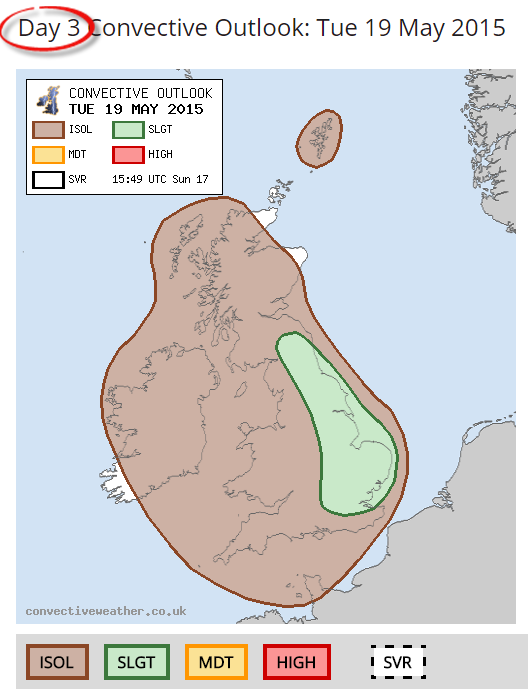 Nevertheless, some hail and thunderstorm activity is rife across the UK today in this unstable polar maritime airmass. Storm Katie is riding a powerful jetstream and deepening rapidly over the Atlantic through today. She is some 600miles away to the SW but approaching and deepening rapidly as she undergoes rapid cyclogenesis (RaCy) falling from 999mb to 975mb: 24mb in 24 hours, qualifying as a “bomb depression”. Katie emerged out of Canada earlier this week as cold continental air met humid sub-tropical maritime air. She engaged with an active jetstream to be launched across the Atlantic. 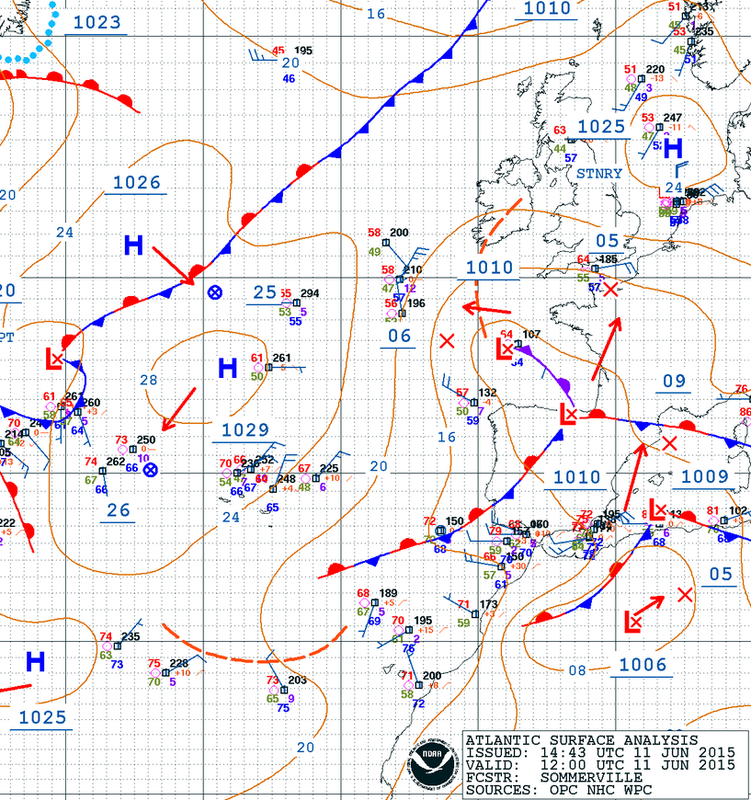 Storms tend not to move fast and deepen rapidly at the same time, so her rapid progress across the Atlantic will now slow as she now expends more energy lowering pressure on her approach to the UK. Katie also has some similarities to the October 1987 but again is significantly less powerful than that rare 200 year event. The water vapour sat pics below show the evolution of Katie and cirrus cloud associated with the jetstream. 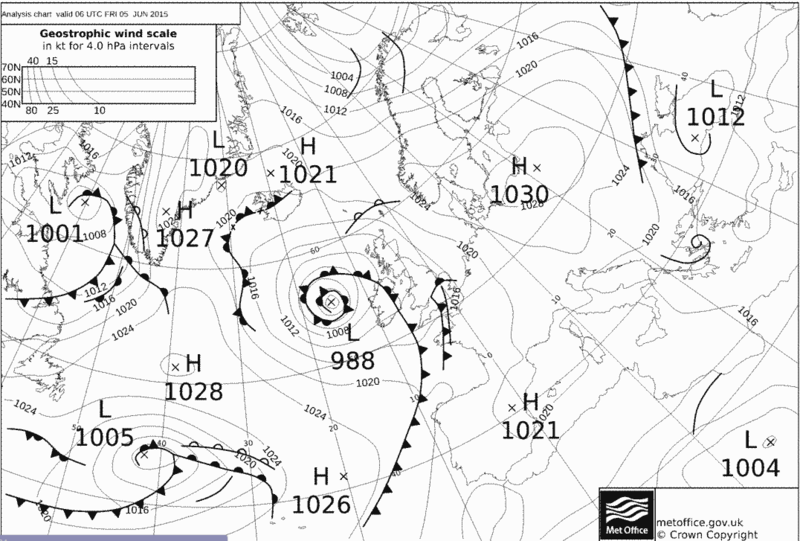 Storm Katie is forecast to deepen through the SW approaches to below 980mb on an expected track overnight Sunday-Monday from Biscay into the Bristol Channel through to exit around the Wash. The pressure gradient between the Isle of Wight and the Wash could be as much as 12mb… the highest of our Wight-Wash Oscillations recorded, and greater than the 10mb WWO recorded in StJude, if this comes off. However, the pressure rise behind Katie is expected to be less rapid and sustained than St Jude, so this critically reduces the potential for highest gusts, sting jets aside. The highest wind speeds for Storm Katie will be south of the low core in the occluding warm sector in the small hours of Monday morning. Max gusts of over 80mph are possible in the Channel, 70mph along Channel coasts and 60mph further inland. For Reigate this means a brief episode of gusts possibly exceeding 50mph and more over exposed hills. This could wake people up momentarily as gusts roar through trees and round houses. 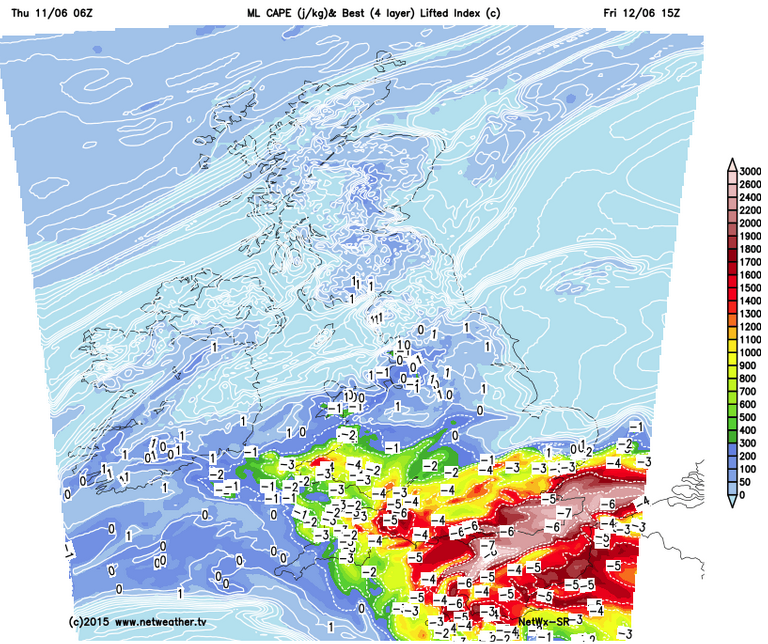 Rainfall will be significant too and some hi res models put down >40mm over parts of the North Downs, showing the significance of small hills in generating orographic rainfall. Rainfall more widely is more likely to be around 20-30mm, enough for local flooding. The MetOffice have issued a yellow warning for Storm Katie. 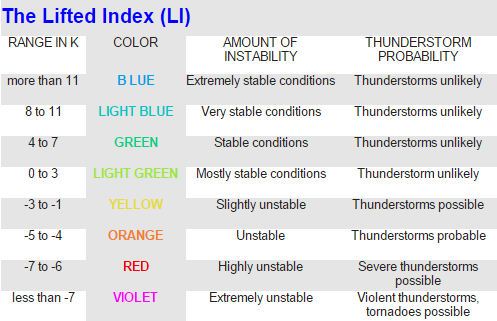 Check the weather impact matrix showing moderate likelihood of moderate impact (low yellow). Update: Amber warning issued for Storm Katie. Furthermore, evolution so far matching StJude and the Wight-Wash pressure gradient forecast seems to be matching or beating St Jude. 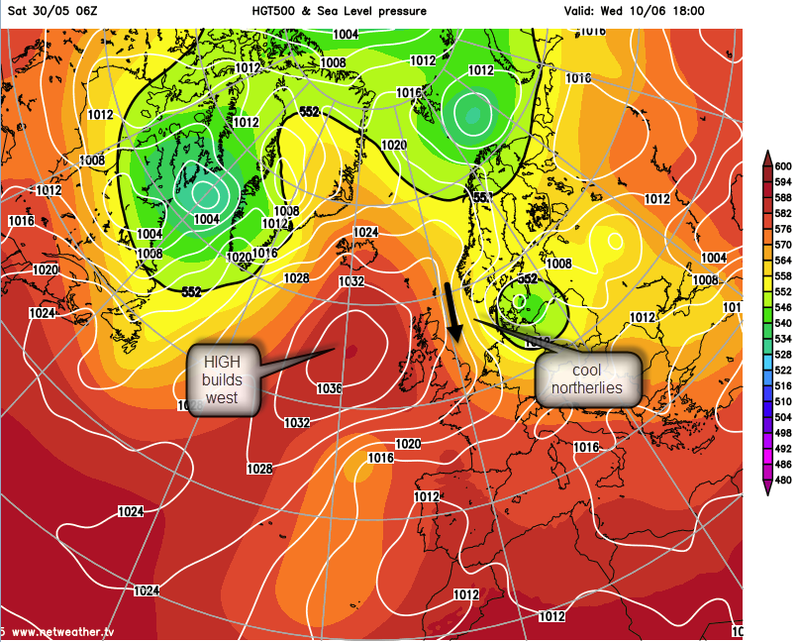 Post-Katie we enter a broadly zonal westerly flow but turning cooler as slack winds swing northerly through the week as LOW pressure moves into North Sea/Scandinavia. 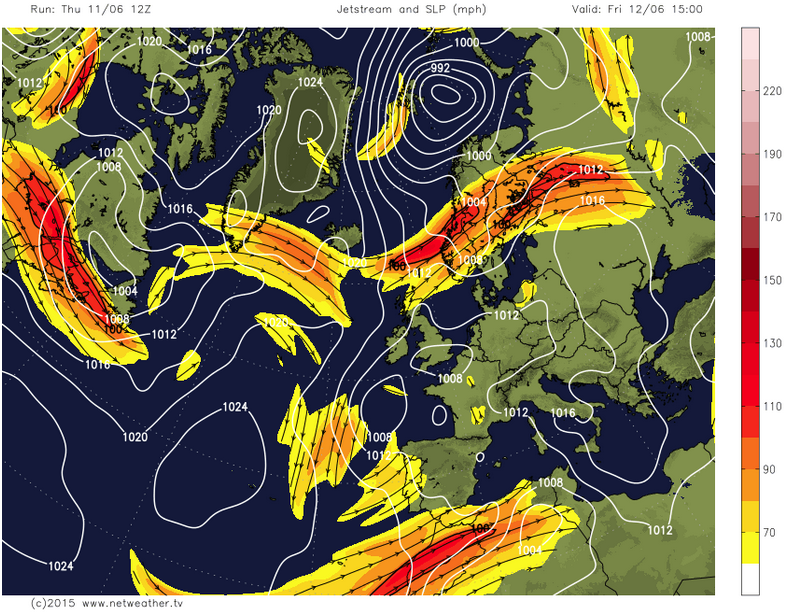 Unsettled and showery activity continues through the week but with pressure slowly rising from the west by Thursday. No further significant storms are expected for the time being. Into the start of April, pressure over the Atlantic is expected to rise and progress over the south of the UK into Europe to give a settled period for the start of April. RGSweather is off to East Iceland, so expect occasional tweets and updates from cooler climes. various meteorological impacts show Katie exceed StJude in power but both fall well short of October 1987 Great Storm. Rapid rise in River Mole catchment – no significant flooding but overtopped bankfull stage. Note, compared with the Oct ’87 storm Katie and St Jude are found wanting. The Wight-Wash Oscillation for the 200 year storm of October 1987 was a whopping 20mb! See the chart below for the exit of the Oct 87 storm through the Wash on 16 October 1987. Finally, which of these big SE storms are most powerful? 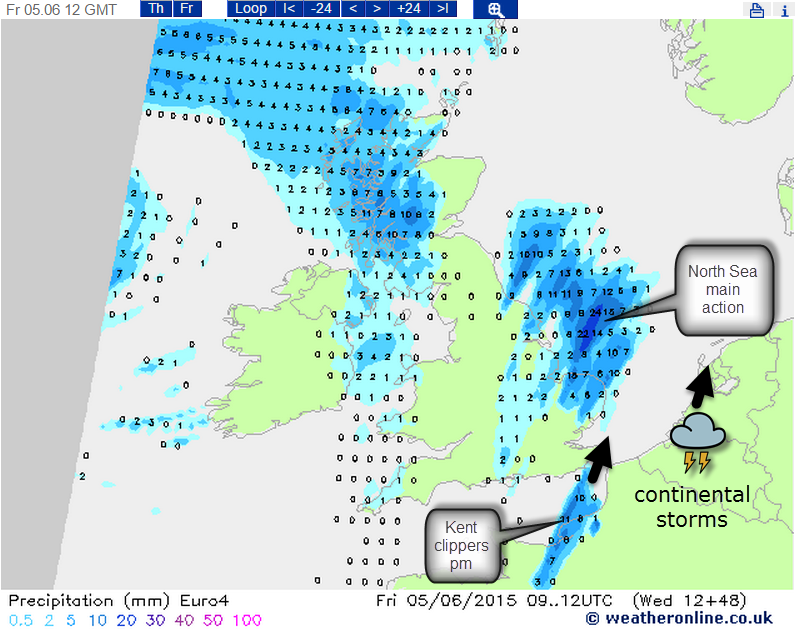 Play SE storms TRUMPS to find out..
#Reigate Friday plume de ma taunt? A brief, rather marginal, teasing Spanish Plume is developing in the next 48 hours and might cause the first significant thundery activity of the year in the SE Thursday into Friday this week. 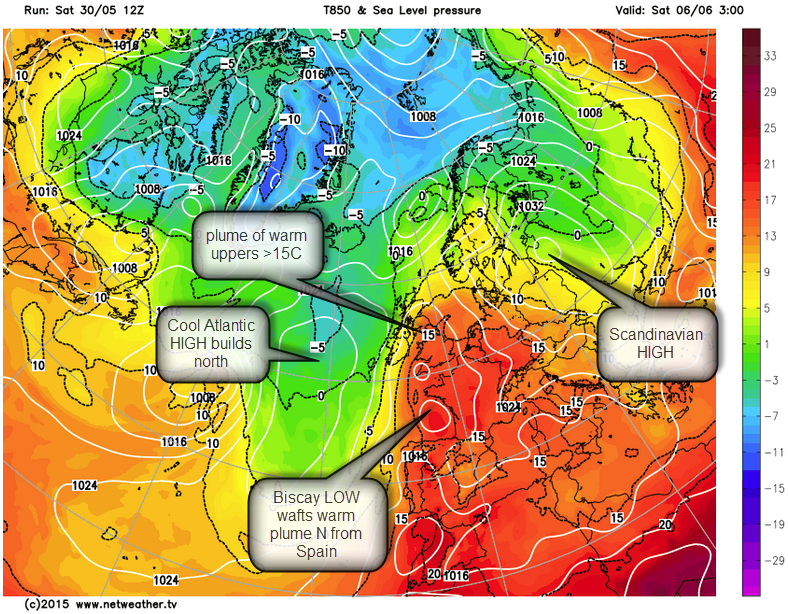 A Spanish Plume (written up here previously from 2014) is a plume of warm air that rides north, out of Iberia, through France and over the UK. It is often accompanied by a preceding south easterly from a warm or hot continent. This mix typically causes humid weather and thunderstorms, but plumes vary in quality! 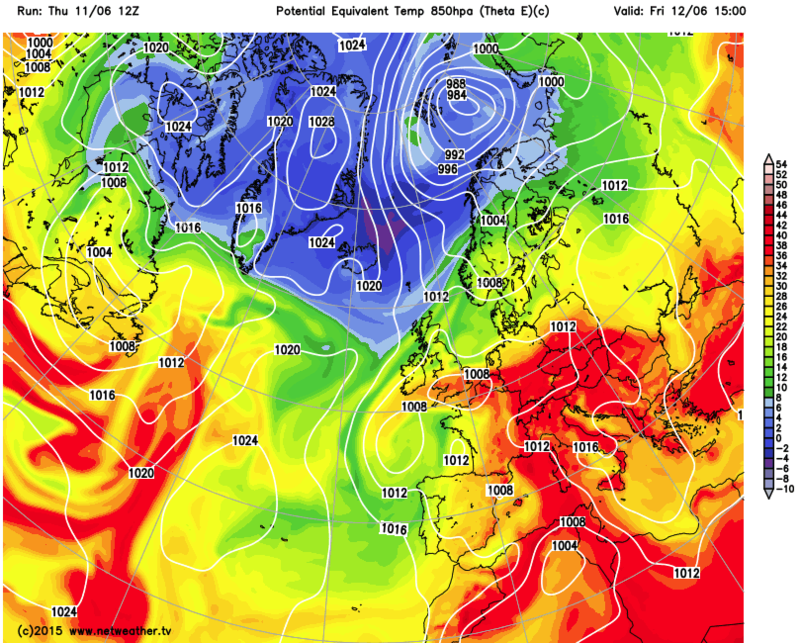 This particular episode is marginal for the UK, and taunting forecasters, because the heating episode is very brief and most of any heat and resulting instability is forecast to remain over the continent impacting N France and Benelux with decent thunderstorms before they migrate into the North Sea. The UK might see little of this in comparison. Whilst it is not certain that thunderstorms will develop over the UK, some action is likely in the S/SE and East Anglia during Friday. A MetOffice warning was issued earlier today but note the very low likelihood of moderate impact. 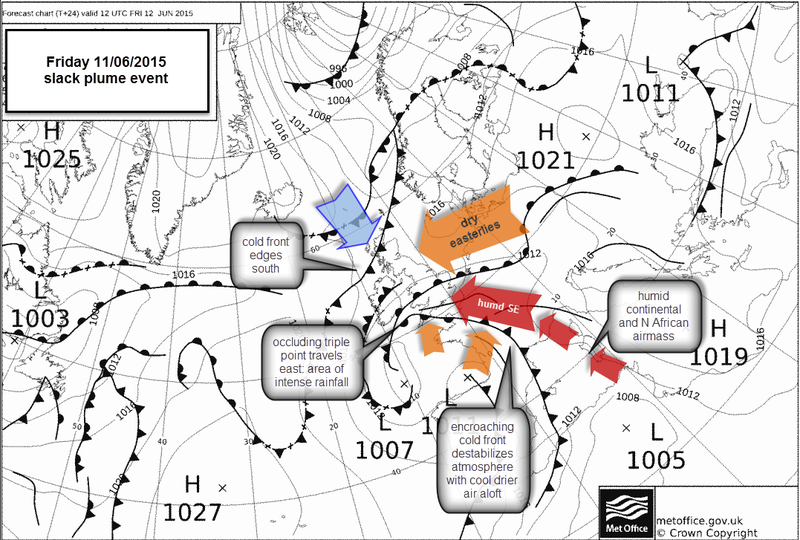 It’s worth recording here because it is a similar synoptic set up to the first plume event of June 7 2014 which created relatively perky thunderstorms to the SW and elevated rumbles and thundery showers over SE. 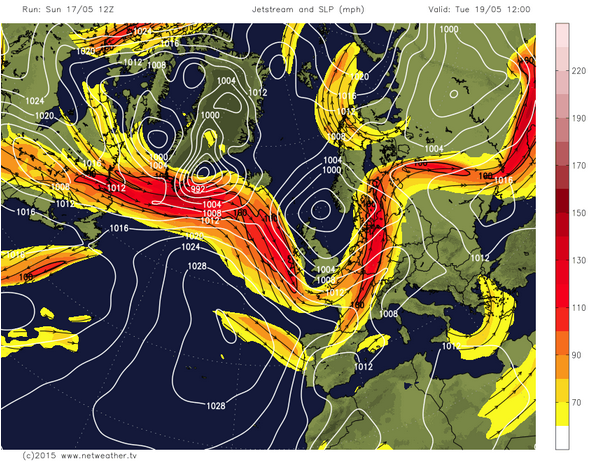 The charts below show streamlines at different levels associated with the plume on Friday. The plume on Friday is a heavily cut-down version of the “heat wave” that the charts flirted with last week. 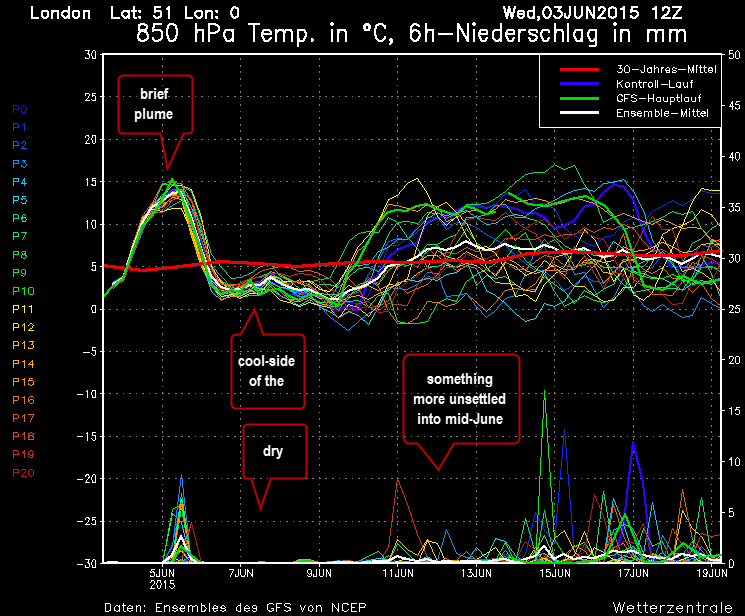 The heat wave is not going to happen but a day of warm / hot conditions will brush fleetingly past the SE. Upper air over 15C is set to push in from the continent through Thursday night into Friday morning and will quickly waft over the S/SE and raise temperatures to Tmax 27C before quickly being pushed east by cooler Atlantic air arriving later Friday. This warm “heat” spike for the SE is caused by HIGH pressure (currently over the UK) slipping NE towards Scandinavia, followed closely by an Atlantic LOW edging in from the west. The result is a humid surface S/SE flow from the continent with an upper airflow directed from Iberia meeting cool polar maritime from the Atlantic. 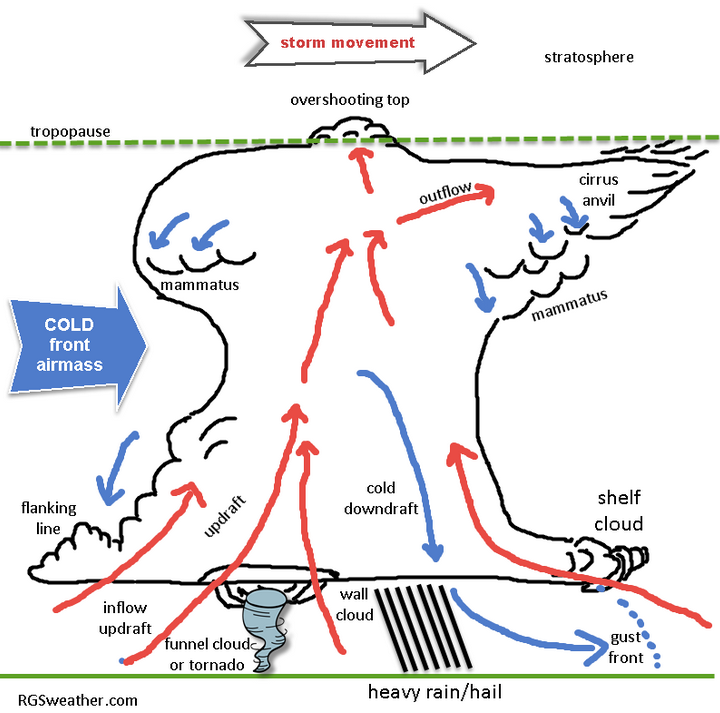 The convergence of these airmasses can cause steep lapse rates (rapid drop in temperature with height) and instability, in which saturated air rises freely to a great height creating tall thunder clouds. The charts below show some of the parameters involved: note the relatively high (but brief) CAPE values and PWAT (water content). 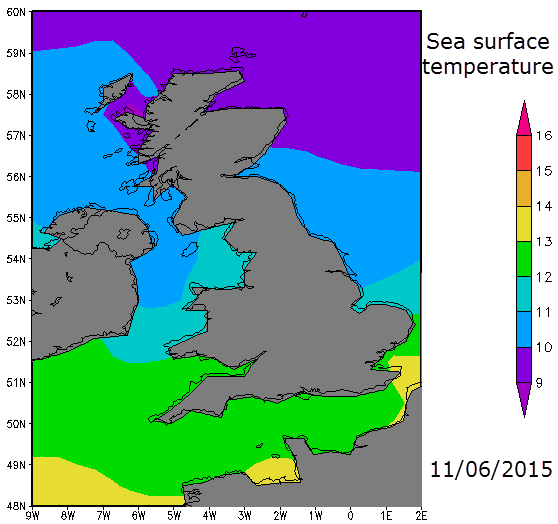 The limiting factor might be low SST temperatures over the Channel which could subdue any imported storms from France. 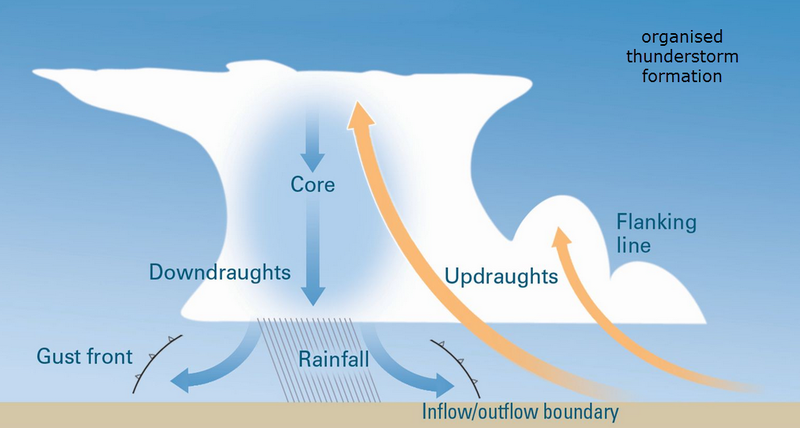 Instability can be caused locally if the sun comes out and heats the surface sufficiently to erode the “cap” and release parcels of warm air that rise, condense and form cumulonimbus clouds. Upper air is cold enough to cause hail as updrafts keep driving precipitation aloft into freezing cloud top temperatures below -30C. If it stays cloudy we can still get elevated thunderstorms imported in unstable upper air from the continent. 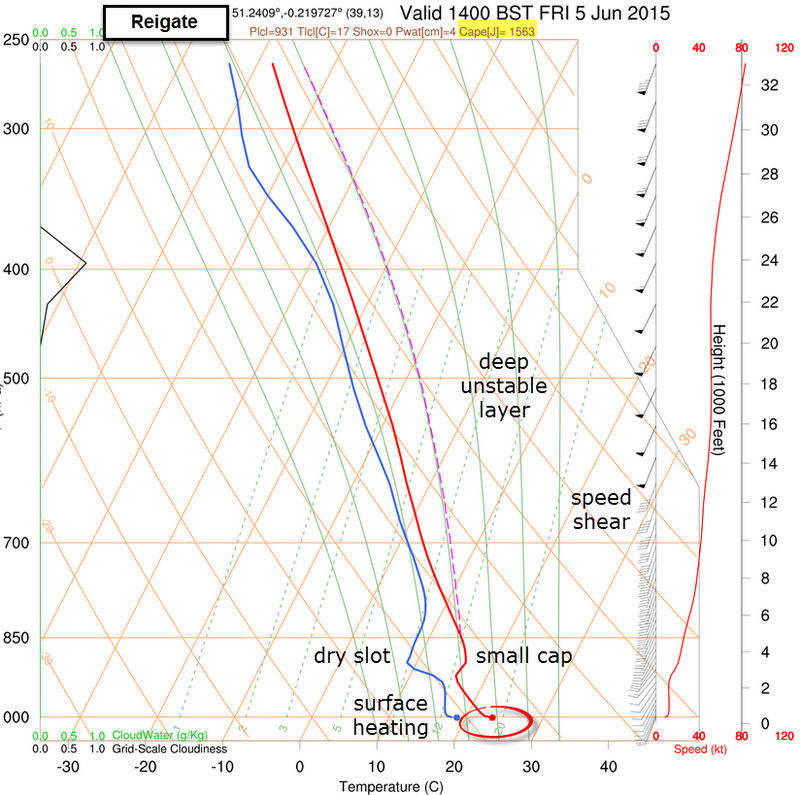 Skew-T diagrams show the relatively unstable situation forecast for Friday. 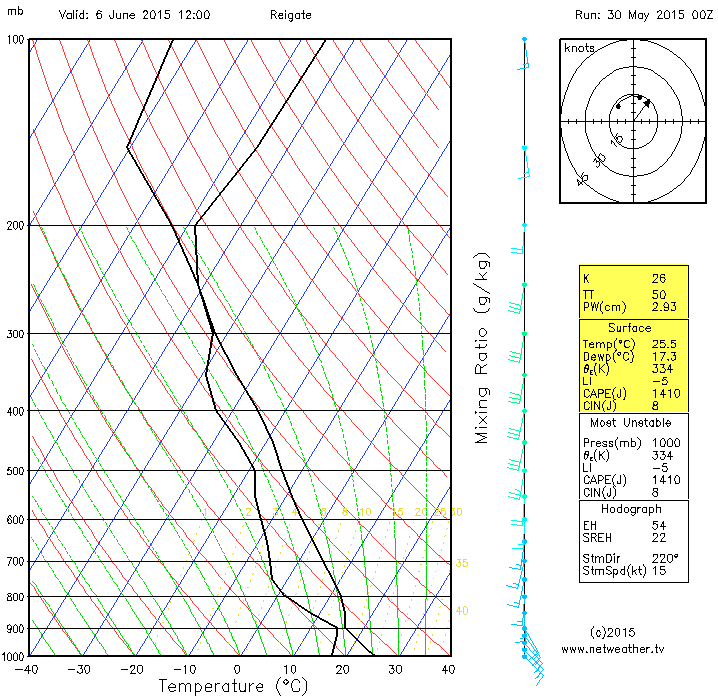 A dry slot / hydrolapse (where dew point departs markedly from air temperature in a mid layer) can increase potential instability because evaporative cooling in any dry mid-layers can increase instability by increasing the difference in temperature between rising thermals and environmental air (though 700hPa dry layers I think are more significant than the lower layer shown below). 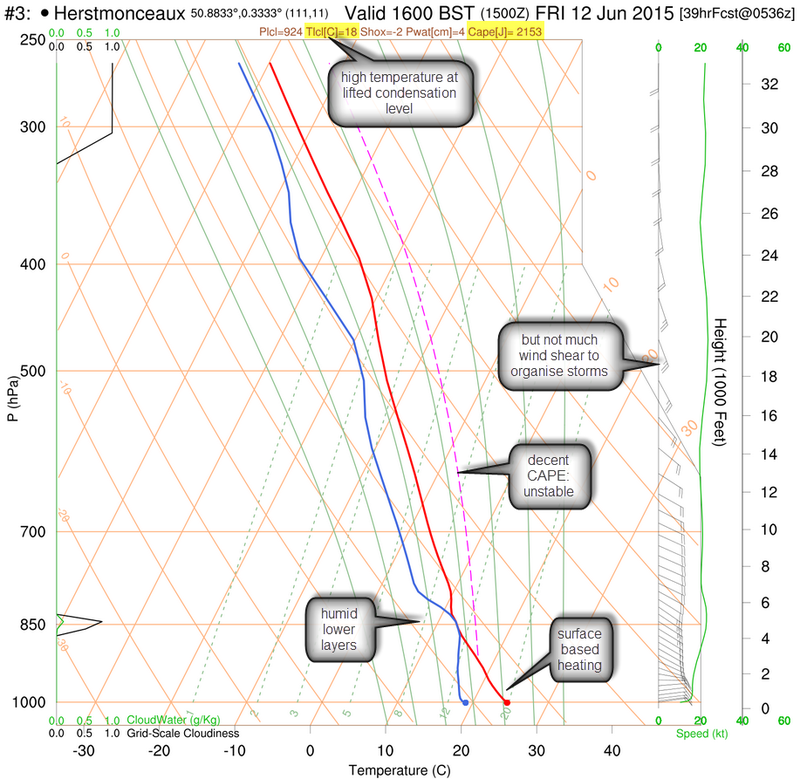 It is most likely that the plume will be cut off rapidly before heat can establish and cause whopping storms. Nevertheless, heavy thundery showers are likely here and there. The latest GFS charts from lightning wizard suggest a low risk of meso-scale convective systems earlier on Friday being imported from France into the south coast in the LOW pressure moving North from Spain. Later in the day any action is likely to migrate further east into the SE / East Anglia. Most action will be on the continent where some significant thunderstorms are likely. The charts below show how rapidly the cold air makes progress east. Once this arrives the plume is cut off and convective activity associated with it ends. 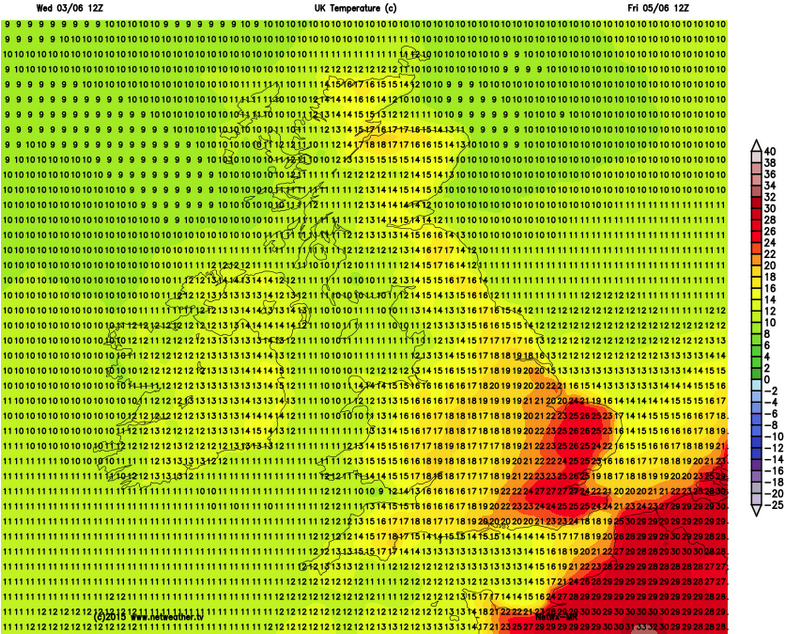 Looking ahead, pressure is expected to rise into the weekend in the south so it will be dry and pleasant, but not hot. Into next week things look similarly benign with high pressure mostly in charge in the Atlantic feeding a flow of cooler air keeping us a tad below average in terms of temperature. Into mid-June things become more unsettled.